Bacille Calmette and Guerin (BCG) is the only vaccine used since 1921 to protect against tuberculosis. It is a live vaccine, derived from Mycobacterium bovis, which has been attenuated in vitro. It confers protection of the order of 80% against miliary tuberculosis and tuberculous meningitis [1Colditz GA, Berkey CS, Mosteller F, et al. The efficacy of Bacillus CalmetteGuérin vaccination of newborns and infants in the prevention of tuberculosis: meta-analysis of the published literature. JAMA 1994; 271: 698-702. [http://dx.doi.org/10.1001/jama.1994.03510330076038] [PMID: 8309 034] ]. However, the BCG disease is a rare and specific complication, often benign in an immunocompetent patient but it can be serious in immunodepressed and whose therapeutic protocols are very controversial [2Kourime M, Akpalu ENK, Ouair H, et al. Bécégites de l’enfant: diagnostic, classification et exploration. Archives depédiatrie 2016; 23(7): 754-9. [http://dx.doi.org/10.1016/j.arcped.2016.04.003] ]. 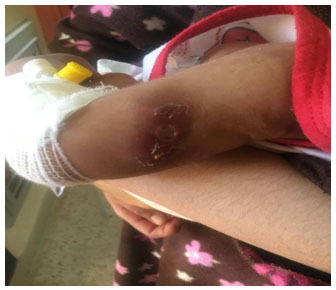 We report a case of locoregional BCGitis revealing a retroviral infection (HIV) in the department of pediatric in Mohammed VI University Hospital of Marrakech in Morocco. Initial management included rehydration, nutritional rehabilitation and antibiotic therapy with metronidazole and third-generation cephalosporin. 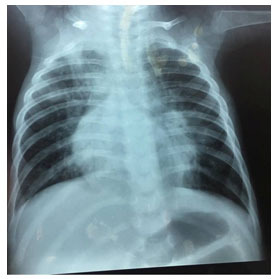 Thereafter the patient presented a urinary tract infection caused by multi-drug resistant Klebsiella pneumonia treated with colistin and amikacin, with bilateral pneumonia (Fig. 1 ) not responding to antibiotic treatment, and a left axillary adenitis, measuring 4cm / 3cm (Fig. 2 ) with purulent ulceration of the BCG scar (Fig. 3 ) Mycobacterium was not detected by smear microscopy and Gene xpert. The histological study of lymph nodes found a loss of follicular architecture, the ultrasound examination objectified a cluster of left axillary lymphadenopathy, so a BCGitis was retained. Therefore, the recurrent infections and loco-regional BCGitis made us suspected about immunodeficiency. At the time, HIV serology was positive (An ELISA test, Confirmed by the Wesrern Blot) with a low level of CD4: 214 cells / mm3 and high level of viral load at 6135907 copies/ml. Co-trimoxazole therapy was initiated followed by rifampicin, isoniazid, pyrazinamide and ethambutol with the application of local isoniazid powder. Three weeks later, antiretroviral therapy was introduced to prevent immune reconstitution inflammatory syndrome (IRIS); the HAART was commenced with 2NRTIs (nucleoside reverse transcriptase inhibitors) associated to PIs (protease inhibitors). He completed nine months of antituberculous therapy with a good outcome (Fig. 4 ), and the CD4 count: 1050 cells / mm3 and the viral load at 40 copies / ml. Bilateral alveolar syndrome, bilateral pneumonia. 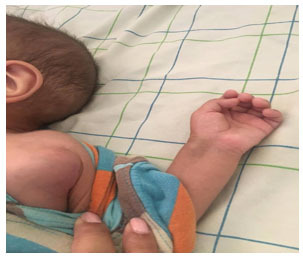 The left axillary adenitis 4cm/3cm. Purulent ulceration of the BCG scar. (a) good outcome of ulceration of the BCG scar (b) good evolution of left axillary adenitis. BCG vaccine consists of a live attenuated strain of Mycobacterium bovis, It is harmless in most children. Its protective effect has been estimated in several studies between zero and 80% [3Hengster P, Schnapka J, Fille M, Menardi G. Occurrence of suppurative lymphadenitis after a change of BCG vaccine. Arch Dis Child 1992; 67(7): 952-5. [http://dx.doi.org/10.1136/adc.67.7.952] [PMID: 1519963] ]. Complications of BCG are generally benign in immunocompetent individuals, which are most often due to technical errors of vaccination. On the other hand, in an immunocompromised subject, these reactions are often severe, sometimes even fatal [2Kourime M, Akpalu ENK, Ouair H, et al. Bécégites de l’enfant: diagnostic, classification et exploration. Archives depédiatrie 2016; 23(7): 754-9. [http://dx.doi.org/10.1016/j.arcped.2016.04.003] ].The BCG diseases (BCGitis or BCGosis) are distinguished by the normal reaction of BCG basen on their morphological and evolutionary differences. They must also be distinguished from local pyogenic abscesses with reactive adenitis whose onset is shorter and shows good outcome with antibiotherapy [2Kourime M, Akpalu ENK, Ouair H, et al. Bécégites de l’enfant: diagnostic, classification et exploration. Archives depédiatrie 2016; 23(7): 754-9. [http://dx.doi.org/10.1016/j.arcped.2016.04.003] ]. There are four categories of BCG disease according to their location in relation to the BCG scar: local, regional, distant BCGitis and disseminated or BCGosis [2Kourime M, Akpalu ENK, Ouair H, et al. Bécégites de l’enfant: diagnostic, classification et exploration. Archives depédiatrie 2016; 23(7): 754-9. [http://dx.doi.org/10.1016/j.arcped.2016.04.003] ]. The diagnosis of disseminated BCGitis requires the search for immunodeficiency. This may be a “classic” immune deficiency, as it may be a defect in the IL-12/23 and IFN- γ pathways (Mendelian Susceptibility to Mycobacterial Disease) [4O’Brien KL, Ruff AJ, Louis MA, et al. Bacillus Calmette-Guérin complications in children born to HIV-1-infected women with a review of the literature. Pediatrics 1995; 95(3): 414-8. [PMID: 7862483] -6Krepela V, Galliová J, Kubec V, Marík J. [The effect of reduced doses of BCG vaccine on the occurrence of osseous complications after vaccination]. Cesk Pediatr 1992; 47(3): 134-6. [PMID: 1591808] ]. In our case report, the BCGitis was loco-regional: the occurrence of purulent ulceration at the BCG scar and ipsilateral axillary adenitis without other localizations especially without hepatomegaly and splenomegaly. The history of recurrent otitis, oral candidiasis, chronic diarrhea, and failure to thrive has made us think of immune deficiency. The treatment of the BCGitis is not codified [7Ladeira I, Carvalho I, Correia A, Carvalho A, Duarte R. BCGitis in children. Rev Port Pneumol 2014; 20(3): 172-3. [http://dx.doi.org/10.1016/j.rppneu.2013.12.003] [PMID: 24529481] ]. Some require primary surveillance, while others require antituberculous therapy from the start [8FitzGerald JM. Management of adverse reactions to bacille Calmette-Guérin vaccine. Clin Infect Dis 2000; 31(Suppl. 3): S75-6. [http://dx.doi.org/10.1086/314074] [PMID: 11010827] ]. For local BCGitis, some teams recommend oral isoniazid or local powder, but without controlled studies. Therapeutic aspiration is indicated in suppurative adenitis or local abscess more than 3 cm. In case of failure or fistulization, surgical excision should be discussed [9Goraya JS, Virdi VS. Bacille Calmette-Guérin lymphadenitis. Postgrad Med J 2002; 78(920): 327-9. [http://dx.doi.org/10.1136/pmj.78.920.327] [PMID: 12151684] ]. In distant BCGitis, antituberculous therapy is essential but there is no consensual treatment. Hesseling et al. recommended a treatment with a quadruple combinational antituberculous therapy [10Hesseling AC, Rabie H, Marais BJ, et al. Bacille Calmette-Guérin vaccine-induced disease in HIV-infected and HIV-uninfected children. Clin Infect Dis 2006; 42(4): 548-58. 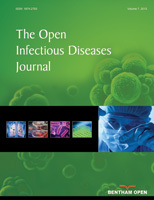 [http://dx.doi.org/10.1086/499953] [PMID: 16421800] ].In an immunocompromised patient, antibacillary treatment is always recommended with quadruple combinational at least for 9 months [10Hesseling AC, Rabie H, Marais BJ, et al. Bacille Calmette-Guérin vaccine-induced disease in HIV-infected and HIV-uninfected children. Clin Infect Dis 2006; 42(4): 548-58. [http://dx.doi.org/10.1086/499953] [PMID: 16421800] ]. The introduction of highly active antiretroviral therapy in HIV-infected individuals is essential [10Hesseling AC, Rabie H, Marais BJ, et al. Bacille Calmette-Guérin vaccine-induced disease in HIV-infected and HIV-uninfected children. Clin Infect Dis 2006; 42(4): 548-58. [http://dx.doi.org/10.1086/499953] [PMID: 16421800] ]. In our case report, the BCGitis was treated with quadruple combinational for 9 months in addition to local treatment with isoniazid powder; three weeks later, the antiretroviral therapy was commenced because the risk of IRIS was high. 3 years later, the outcome was favorable.